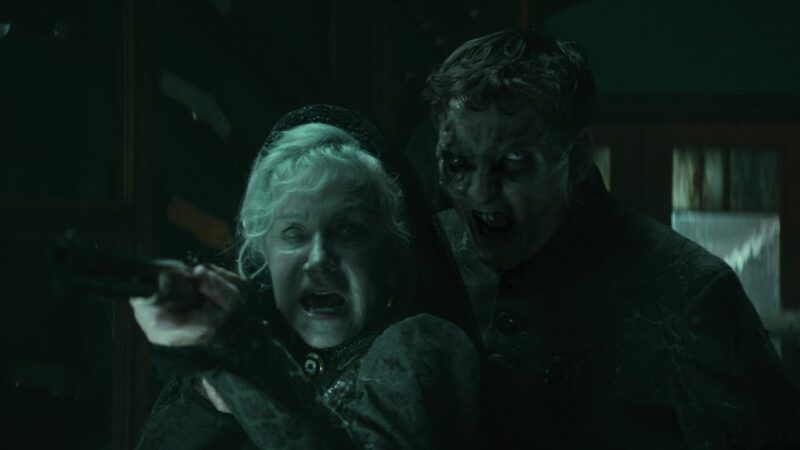 As the principal VFX and post production vendor, Cutting Edge delivered 183 VFX shots and provided full post-production services. 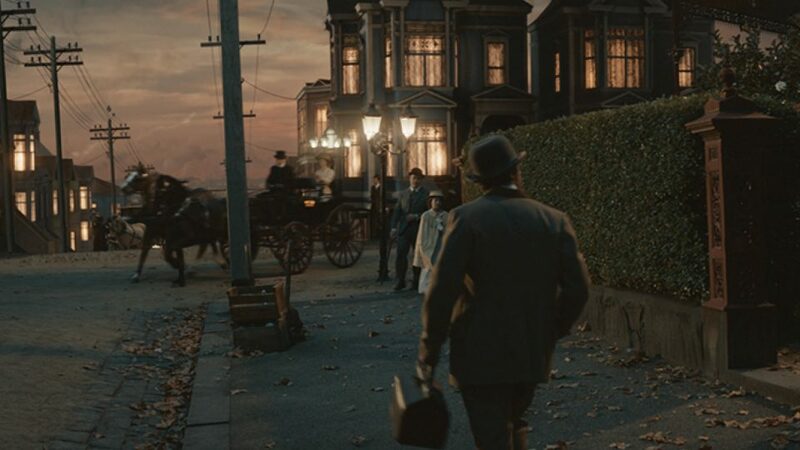 Highlights from our VFX team’s work included the creation of the 1906 version of the Winchester mansion, by digitally extending a single floor of a practical facade, and a foreboding levitation scene, requiring CGI rifles and debris. 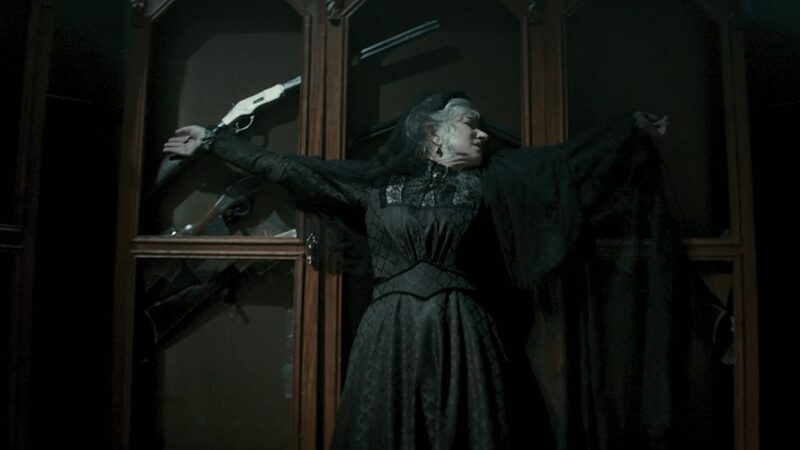 The Winchester Production Designer Matt Putland, built the first floor of the mansion in Melbourne. The design of the facade was a close match to the house as it still stands in San Jose, with the paint colour changed to be more historically correct. Whenever the shots were wider, such as establishing shots and tilt-ups, the vast size of the mansion needed to be represented. 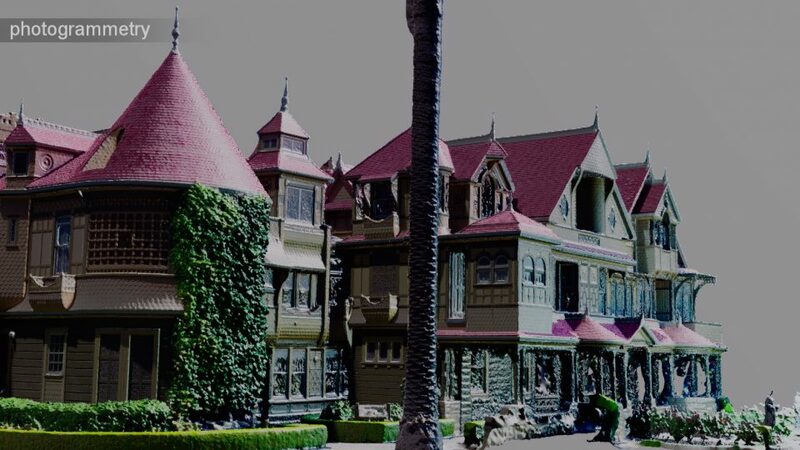 Exterior tilt-up VFX shot of the Winchester mansion. 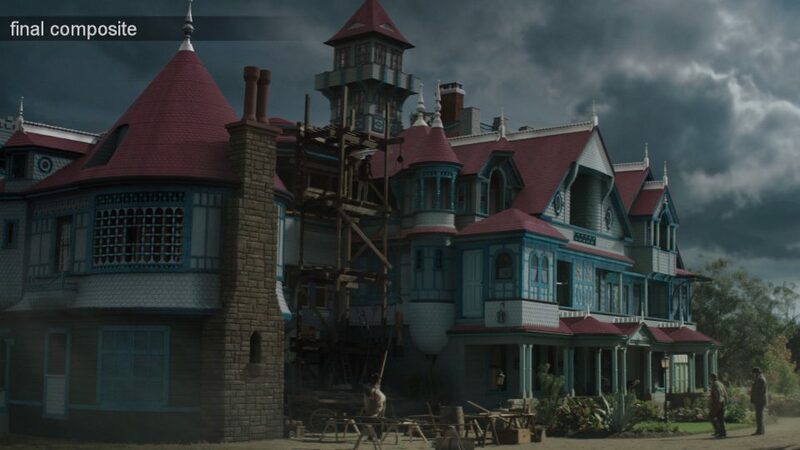 Joining the production at the San Jose location, VFX Supervisor Rangi Sutton worked with the local drone team headed by Jesse Kaltenbach to capture over 4000 images of the mansion from a drone and hand held cameras. Back in Brisbane, Senior Cutting Edge 3D Artist Robert Kelly, compiled the drone photographs into the photogrammetry package Agisoft PhotoScan to create the CG base model of the estate. This gave the team a model to start placing into shots and aligning with the facade. 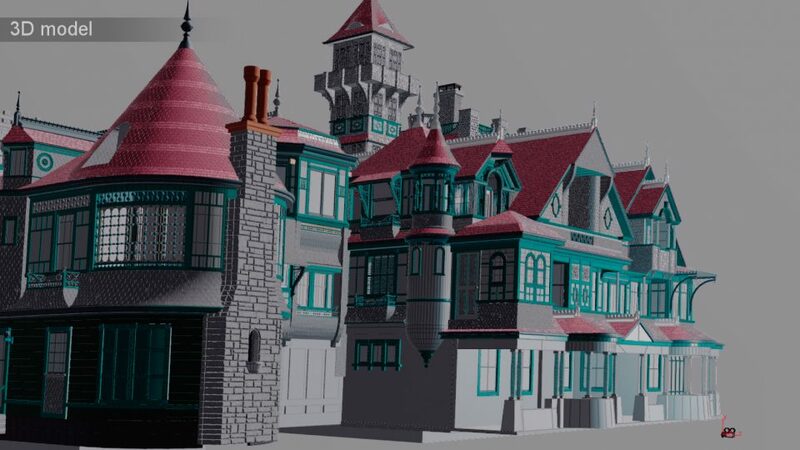 Building the Winchester mansion: From photogrammetry to 3D models and final composite exterior shots. 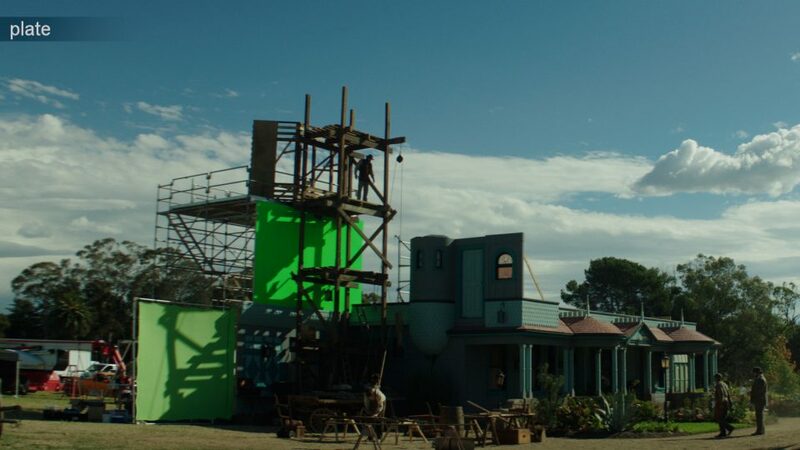 With these core components ready, the VFX shots placed 3D extensions into the camera matched shots. The photogrammetry was an excellent guide to how things should be, but was too soft – especially in the details for the distinctive fish-scale wall tiling – and the house was the wrong colour for the period. Section by section our artists replaced the photogrammetry with modelled sections. This was a combination of Maya for the broader architecture, and Houdini to add the procedural shingles and repeating features. While the production crew was at the San Jose location, historian Janan Boehme revealed the deconstructed remains of the seven-story tower, that stood prior to the 1906 earthquake. When the tower came down, it wasn’t destroyed. instead, it was stored in pieces. By using measurements and photographs of all these pieces, together with two historical photographs of the tower, an accurate 3D reconstruction was made. Earthquake Sequence: Replicating the effects of the 1906 San Francisco earthquake. 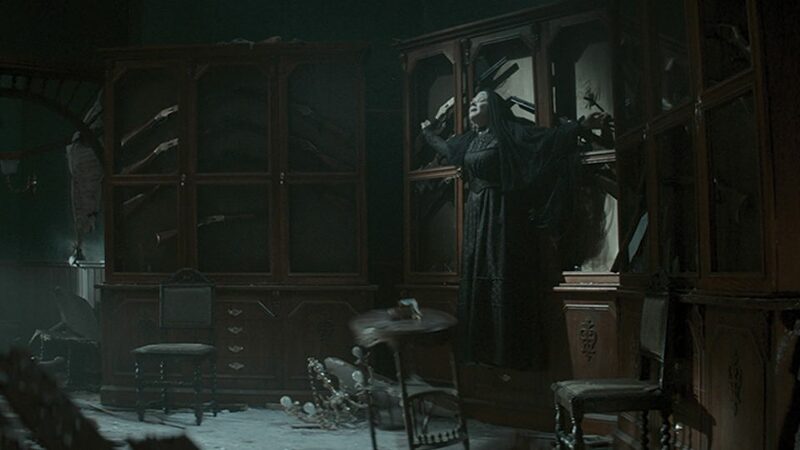 Amongst the on set debris from the earthquake, the climactic scene required our VFX artists to generate a paranormal encounter featuring a standoff between the main characters and a room full of eerily levitating Winchester rifles. Having fallen from their glass display cases, the rifles are surrounded by glass and plaster and are covered in dust particles. Rifles float in mid-air surrounded by flying glass fragments and particles before they take aim. The practical on-stage armoury had 50 rifles, of which Cutting Edge photographed individually. To build that much variation into the levitating swarm, the 3D artists lead by Senior 3D Artist Chelsea Shannon, turned to procedural – or programmed – textures. This produced unique wood grain patterns and colours per rifle. 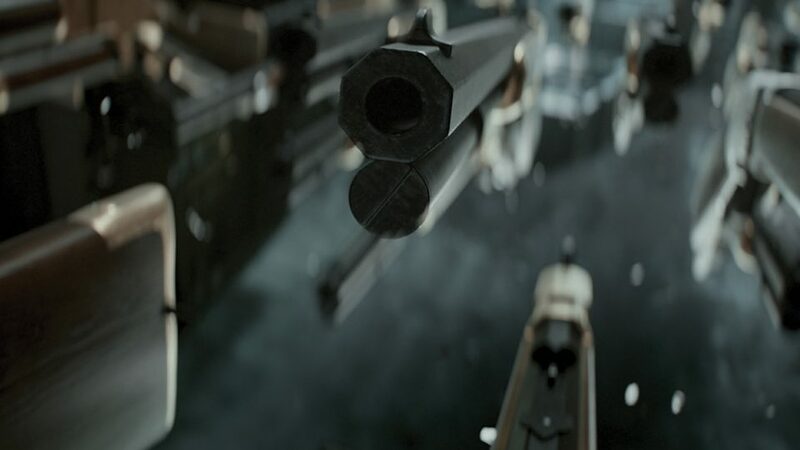 The dust splattered over the rifles was handled with a mixture of photographic textures of dust splatters, and procedural shaders to place them in randomised patterns around the rifles.